I’ve been having a ton of fun decorating my “branch” display in the front entry. Last week I made some cool snowflakes to decorate it with a winter theme. The snowflake display. . .but that scale needs something. . . So I got it into my head that I needed to put snowballs into the hopper of the scale. But how to make them? It had to be frugal-of course. I really couldn’t justify spending much on this project. It also had to look good-not cheesy. I thought about paper mache. . . too messy. A reader suggested wrapping white yarn around balls of paper. Hmm, that would have worked if I had some fuzzy-ish yarn with a bit of sparkle in it. . . but alas, nothing like that in my yarn stash. In fact no pure white at all, just cream. Then I saw a tutorial over on Crafts by Amanda for Epsom Salt Luminaries and a lightbulb went off! I had a 12pk of clear glass Christmas ornaments I had purchased a year ago to craft with. . . they were just sitting up in my craft closet. I had epsom salts in the bathroom closet (but a container the size of the one I have cost just over a dollar at the drugstore), and I had Modge Podge on hand from my Coiled Magazine Paper Bowls. Basically, this was a FREE craft for me. Even if you purchased it from scratch, you could probably make the whole thing for just a few dollars-especially if you substituted in a bit of thinned classroom glue for the Modge Podge. 1. Take the gold cap off the ornament. 2. Place your Epsom salts in a roasting pan, pie plate or other pan. Find yourself something to use as a scoop. The easy way to hold it. 3. Use a chopstick to hold the ornament. Trust me, I tried my fingers first and you want to use the chopstick. Just use your thumb from the hand holding the chopstick to hold the ball steady. 4. Glop glue/Modge Podge all over the ornament. I found that a daubing motion gave the best effect-when I painted it in lines there wound up being lines in the finished product. 5. Hold the glue covered ornament over your pan and pour the salts on. Turn and pour till it is all covered. I also tried rolling the ornaments in the salt, but didn’t like how that went. Really though-it is up to you. 6. Admire your work. Snow! 7. Prop the chopstick & snowball into a jar so it can dry. 8. Optional Step-you could spray the snowballs with a clear polyurethane. I will probably do this later. I don’t have a heated garage to use, and our basement is open to where the furnace is-so we don’t use spray paint down there in the winter. I literally have no place warm enough to use spray paint/sealer. That’s pretty much it folks. I found this super quick and easy. I went ahead and covered an assortment of glass jars I had on hand as well to make “snow” luminaries for the mantle while I was at it. . . and I still have 1/3 of the small box of Epsom salts left. 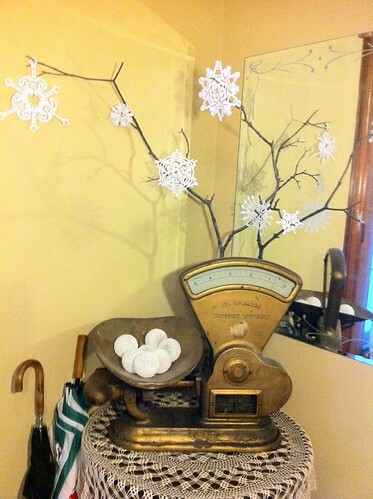 Here are the snowballs in the finished display. Aren’t they fun? Want to use up the rest of those Epsom salts in some crafty goodness? The Inspired Room has ideas of how to use it as snow and how to make cool Epsom Salt candles as well! Actually, I might have to make some of those candles for my mantle display. . .
Love this craft Jenn, I may have to try it at some point, maybe next year. thanks. BTW I love how your blog looks. It’s simple and easy to get around. I LOVE the way they turned out! So pretty! I’m not much into doing crafts, but if I can think of a place to put these, it would make a nice simple thing for me to do. Thanks for the tutorial!